I put up my Christmas tree the last weekend of November. It is certainly a different process than my childhood, as we would have a real tree that would not be cut until December 21st. My father would spend lots of time prior, searching for that perfect tree. Actually, if it was not perfect he would begin the drilling process adding a few limbs and doing the necessary pruning. I would only accompany him on the day of cutting the tree. This was always exciting! Dad would always put on the lights and the garland, then as a family we would add the ornament, especially the old-fashioned glass balls, adding lots of tinsel before topping the tree top off with a handmade angel. Not to be forgotten, the tree was always placed in a plastic salt beef bucket for good measure and stability. I may be getting a little nostalgic, but this was always a special time and these memories of growing up in rural Newfoundland and Labrador as ones I will always cherish. Now the Christmas tree is a modern 8′ artificial, one that was supposedly pre-lit. However, my first order was to remove the 1,000 lights as they never really worked from the beginning and add new ones. These hand-hooked mummer’s, puffins, houses and Inuk are carefully stitched and will joined my salted cod on the line by Anne Hodge-Kirby. The glass and pottery formed salt cod will add to the variety. I love to travel and this past year, I’ve collected ornaments from a family cruise on “Oasis of the Seas”. Our ports of call were in the Bahamas, St. Maartan and St.Thomas, Virgin Islands. As well this past summer, I made my annual trek to Europe, collecting ornaments from Ireland, Switzerland and Liechtenstein. I did not manage a new ornament from Austria or Hungary, despite amazing new experiences and memories of a lifetime. I’ll have to get one on my next return. These ornaments have joined other handmade, felted, fabric, metal or hooked mummer’s, accordions, violins, dories, snowshoes, skin boots, fish and other sea life. There are childhood ornaments and others purchased on trips to London, Olbia, New York and various other places life has taken me. I love decorating the Christmas tree. It brings a smile to my face knowing all the hard work and effort that has gone into producing these ornaments that truly reflect a piece of Newfoundland and Labrador tradition and culture. I also like placing ornaments from New York, recalling ice skating with my mother, sister and brother-in-law in Central Park; the seahorse which brings back a Mediterranean sailing trip with my European friends and of course, my glass ball from Prague – where I lived for four months and had the most incredible experiences and met the most amazing people! 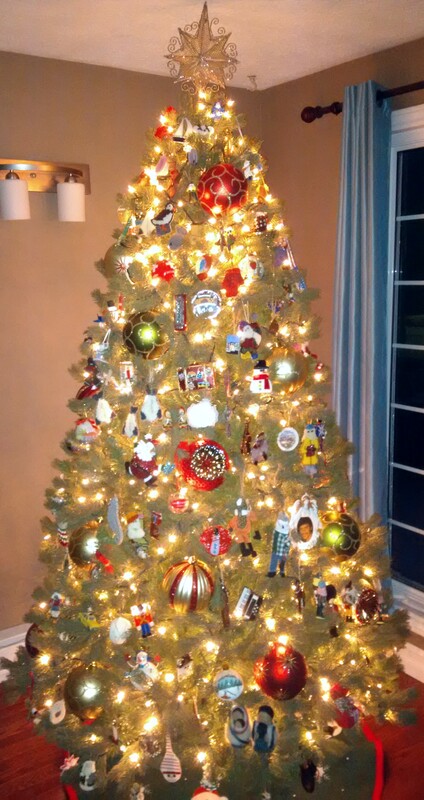 My tree is one filled with memories and the who process makes me very nostalgic. I hope when you decorate your tree, you get similar feelings that reflect upon experiences, friendships, childhood and Christmas past. Posted on December 23, 2014, in Art, Community Economic Development, Heritage, Tradition, Vacations and tagged art, christmas, Christmas tree, handmade, Labrador, Newfoundland, ornaments, Rural, Travel. Bookmark the permalink. 3 Comments. I really enjoy seeing the different ornaments you collect. All of them are beautiful; of course, I enjoy seeing mine 😉 absolutely beautiful, Christopher. Merry Christmas to you and yours. Thanks for the read Christopher, loved seeing your ornaments, never know what to get when I vacation, so the thanks for the idea as well. Merry Christmas and Happy New Year to you and your family. Merry Christmas from Judy & Mike.